Presentation of the game itself is quite interesting to see. Capitalize the graphic display of the darkness with darkness, you will be brought into the ruins of the modern world that has been taken over by nature. Although basically this game uses a cartoon color palette, the effects of lighting and beautiful color filters make it far from the standard. We were made several times amazed when we saw the wonderful effects of the weather and the amazing panorama, even in the midst of the destruction of the world. I think that’s the essence of the whole game, what you can learn from the previous defeat. Do not worry about death, because surely your character will die for a reason. When we played this game, we first died of being bitten by a wolf, a second and a third due to a wild boar, fourth by drowning, fifth due to illness, and so on. However, from each death we improve the record of survival time. Because, every failure becomes a new lesson to help repeat the game from scratch. Note also that this game will always randomize the area encountered and everything encountered in it, every time you repeat the game. This random gameplay system makes the game always fresh and the challenges that will be encountered will always be a surprise. So forget about the intention to memorize anything that will be encountered in the game; it’s best to memorize how to survive based on previous play experiences! 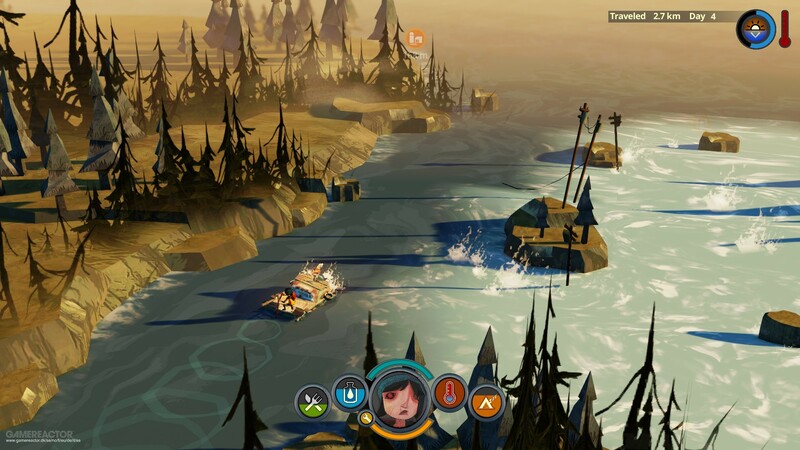 The Flame in The Flood will always challenge you with time. However, that does not mean you will be given countdown as in other action games, for then you will die when the time is up. Against time here means you will always try to find many objects to be a life support. Because, the longer you keep silent, the more time you waste on things that are useful, such as looking for materials to create a trap, in order to catch a rabbit that will become dinner today. helpful in the game, but doing it will spend your stamina. So, it can not always be used. As mentioned earlier, this game is just like racing with time. So running is a necessity that needs to be carefully considered during its use. All these objects will be used in survival. In addition can be consumed, materials obtained on the way will also be used in crafting. At least you can find up to more than 60 types of objects in the crafting. Starting from food, drinks, clothing, weapons, traps, to drugs can be found in the crafting. Various objects have a variety of materials and the composition of the amount. That’s why it’s very wise to always look at crafting recipes and compare them with what’s on the way. Because, there could be important objects that can actually be made but need another one made with crafting first. The main element that became a major disaster in The Flame in The Flood was the great flood. When playing, you will realize there is so much water flowing in this game. For that reason also every area in this game separated by a big river. Fortunately, your character along with his beloved dog has a raft that is able to wade through the river until you find a new area. Keep in mind also that the area you have passed can not be re-visited. So, you will always follow the flow of the river to the more difficult terrain. On many occasions you also inevitably have to give up the targeted area because you want to collect the materials that are typical of the area. Although the area close to you will be square off with a special icon, it’s still pretty hard to reach when the stream you follow does not lead to it! Great write up on the game, thanks for sharing my friend.